It was a long trip. Sixty-eight days to be exact. That was for Satyen Das to pedal his rickety bicycle rickshaw from the seaside city of Kolkata to the roof of the world at a 17,600-foot Himalayan pass. He wanted to show that his rickshaw was an environmentally sound travel option. He pedaled toward the top of Khardung La. It's the world's highest motorable pass. He remembered the words of his wife and 9-year-old daughter: "You must complete this mission." The journey was arduous. His rickshaw is a carriage-styled seat hooked to a bicycle. He had to carry heavy items and cycle long distances. He added a third brake pedal. And when the time came to set off on his journey on June 11, he packed lightly. He took only a few items, including clothing, medicine, food and a stove. "I crossed five high mountain passes on the way," Das, 40, said. At one point, he faced a group of bears. He was relieved when they showed little interest in him or his rickshaw. Near his destination, he took shelter with Indian military forces after sighting an elusive snow leopard in the high reaches of the region of Lakadh. And on his way home, another cyclist in the mountains offered him food and shelter from the cold. In total, he covered nearly 4,440 miles. That made him the first to accomplish the feat. He hopes to have it endorsed by Guinness World Records. 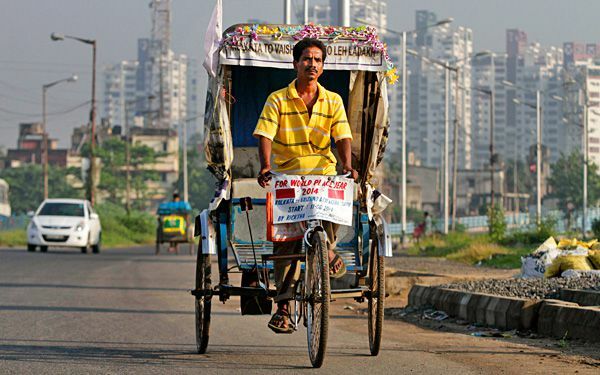 The idea "was to popularize the cycle-rickshaw as eco-friendly transport that does not need any fuel," he said. It's a mode of transport he and his family have relied on their entire lives. Das earns about 200 rupees ($3.20) a day transporting passengers in Kolkata. It's the capital of India's West Bengal state. 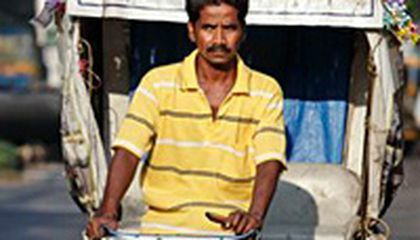 Das started as a so-called "rickshaw wallah" under his father, who also pedaled a rickshaw for a living. He enjoyed the job, he said. "There was no one to boss me around!" But he always dreamed of setting an example for others. And wondered how to do it being poor and with little education. "I decided to spread the message of peace using my cycle-rickshaw," Das said. He made his first attempt for Ladakh in 2008. He carted his wife and daughter up to an altitude of 13,050 feet. Then he ran out of cash and had to stop. For his latest expedition, he received 150,000 rupees (about $2,460) from a sponsor.